With the advent of the internet, it has become very so simple to connecting with different people and working for the same cause, a similar goal. Whether be it for simple charity purposes or fundraising events, the internet is a great source for getting more donations. As such, we will be taking a look at some of the powerful Donation Plugins for WordPress. So without further ado, let’s get started. Give is one of the most popular donation plugins for WordPress with over fifty thousand active installations. Built from the ground up, once installed, the plugin will integrate a powerful donation platform on your website. You will be able to set up a customized donation form, access donation statistics, and reports, manage donors, and even integrate third-party gateways and services. And best of all, its all for free. Custom donation form builder in your WordPress backend. Plugin inherits theme styling so design blends with your site’s aesthetics. Option to attach goals, multiple giving accounts, custom amounts, terms and conditions, and much more, to each form. Get a complete overview of donation activity with the option to export/import data. Manage donors and access a complete history of their donations. Ability to generate tax-deductible receipts. PayPal Donations WordPress plugin, as you can guess by the name, helps integrate a donation portal in your website with PayPal as the payment gateway. Since PayPal is one of the most popular ways of transacting on the internet, the plugin has managed to gain equal popularity as Give. Once installed and activated on your website, you will have to set up your PayPal ID for the plugin to work properly. Plenty of customization options are also available to make the donation form unique to your website. And with widget and shortcode support, you can embed the donation-form practically anywhere on your website. Add a PayPal donation gateway to your website. Customize the donation button, or even upload your own button. Option to change the donation button placement. Change the default purpose and reference with each donation form. Option to create/customize payment page as well as return page. Charitable is a freemium donation plugin for WordPress websites. For free, you will get access to all necessary features to help you start accepting donations from day one. However, if you want access to more advanced functionalities, then there are paid add-ons available which you can install. With the free version alone, you will be able to create unlimited customizable donation forms, set up PayPal as your payment gateway, manage donations, and even send customized thank you emails to your donors. All these features are sufficient for running a basic donation campaign. Option to create unlimited fundraising campaigns with set goals. Donation forms inherit theme styles. Customization options to tweak the look of the donation forms. Ability to set up PayPal as well as Offline Payment. Access all your donation stats, and export them as CSV reports. Generate and send automated donation receipts via email. Mollie payment forms & donations is a user-friendly payments form and donation plugin for WordPress websites. Following a short setup guide of around 15 minutes, the plugin will help you set up a donation form. The main notable feature of the plugin is that it gives you access to iDEAL as the default payment method, however, support for PayPal and other payment gateways are also included. Now iDEAL is a Dutch payment service with support for all Dutch banks. In fact, over 60% of all Dutch customers prefer iDEAL over PayPal. As such, if most of your donors are residents of the Netherlands, it makes most sense use this plugin. And in the case for international donors, there is support for PayPal, Bitcoin, and other payment methods. iDEAL payment gateway integration along with support for international payment methods. Customize donation forms with custom fields. Unlike some of the other plugins on the list, with PayPal Donation, you won’t be able to set up a donation form on your website. Instead, the plugin allows you to create a custom PayPal donation button which you can embed almost anywhere on your website. Of course, you will have to sign up with your personal PayPal account in order to start accepting payment through the plugin. There is also the option to set up a PayPal sandbox to test if everything is working fine. Lastly, a premium version of the plugin is also available, PayPal Donation Pro, which comes with some more advanced functionalities as discussed below. Embed a PayPal donation button anywhere on your website. View all donations from your WordPress dashboard. Customize the donation button with 7 different variations. Option to upload your own donation button. With Donation Thermometer WordPress plugin, you will be able to display a classic thermometer on your website to showcase fundraising progress. You have the option to place the Thermometer almost anywhere on your site thanks to shortcode support. The thermometer itself is also completely customizable and can be tweaked to your likings. First of all, it will inherit all your theme styles and will blend seamlessly with your site. On top of that, you can play around with the dimensions, alignment, of the thermometer, as well as the currency you want to show. Color, size, different target values, and much more can also be controlled. Adds a donation thermometer to your website to measure and showcase fundraising progress. Plenty of customization options to control how the thermometer looks. Seamless Donations, allows you to seamlessly set up a PayPal powered donation platform on your WordPress website in a matter of minutes. It is completely free to use, but packs in a lot of advanced features we have seen on premium plugins. But with that being said, there are a couple of paid extensions you can install to access more powerful features. With the free version of the plugin, you will get access to automatic recurring payment support, the option to track donors and donations, send customizable thank you messages to donors, Google reCAPTCHA support to fight spam, and much more. The premium add-ons only serve by provided more powerful donor management systems. Setup a PayPal powered donation form on your website. Option to set up a recurring payment form. Send customized thank you mail to donors. Free add-ons for integration with mailing services. Google reCAPTCHA to fight spam. 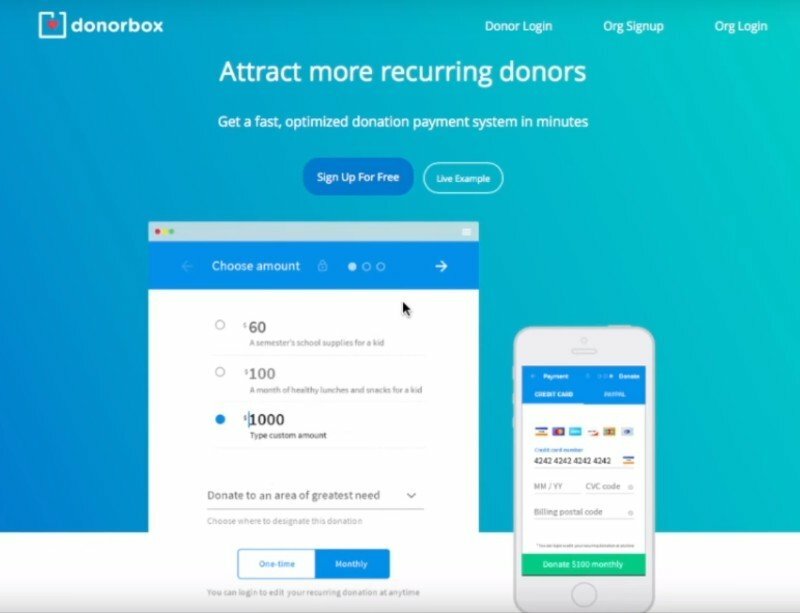 Donorbox WordPress plugin helps you set up a donation management system on your WordPress filled with a lot of useful options. Starting from accepting your initial donation, to end year reporting, the plugin can help with all related tasks. Used by over 7000 nonprofit organizations from around 25 countries, it is extremely popular and powerful. The plugin is essentially free if amass less than $1000 in donations. But for anything above that point, you will be charged 1.5% on each donation. There is also the option to include paid extensions to access additional features. Option to use a donation button instead of a donation form. Support for different payment gateways including PayPal, Stripe, Google Pay, Apple pay, ACH, and so on. Option to take recurring payments. PCI-compliant. Protected by SSL/TLS technology. The clearly named PayPal Donation Buttons WordPress plugin, help you to place a PayPal donation button on your WordPress website. Instead of having to dedicate a lot of real-estate to a full-fledged donation form, the plugin allows you to do away with a simple payment button. You have access to some customization options, including 9 different variations for the button itself as well as option to upload your own custom button. Shortcode and widget support provided so you can place the button almost anywhere on your site. On top of this, donation management is also available. Place the PayPal donation button anywhere on your website. Customizable button with 9 different variations and option to upload your custom design. Donation management system to access donation history and goal. Option to send donation confirmation emails. So these were our picks for the top donation plugins out there for WordPress websites. Do let us know if you found the list to be helpful, and which plugin you picked for your own fundraising project or charity organization. Furthermore, if you experience using any of the plugin mentioned here, then share your insight in the comments below. Not only will it add more value to the read, but fellow readers will also find it helpful while making their own decision.